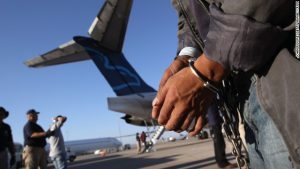 It is our contention that the use of international civilian flights to deport refugees goes against the spirit of the Chicago Convention as reaffirmed by ICAO on December 2017, simply because in many cases innocent refugees are being sent back to a war-torn country where they face near-certain death or torture. Diplomats from 54 world powers risked war-torn skies to meet in Chicago in 1944 (above), where they drafted the visionary Convention on International Civil Aviation (Chicago Convention) which established ICAO. They formalized in the Convention’s preamble that civil aviation should be developed as a tool for world peace and prosperity, and in the decades since aviation’s ability to connect the world’s peoples and cultures and improve the prosperity of local populations has only become more relevant. Today some 10 million passengers take to the skies on 100,000 flights each and every day in aviation’s global network, numbers which are all set to double in the next 15 years based on current forecasts.